Mother and child, India submitted to ‘Mother and Child’ on National Geographic. Kristian Bertel has contributed to the National Geographic Your Shot photo community with an assignment called ‘Mother and Child‘. The photo assignment curated by Stephanie Sinclair, a National Geographic photographer, is focusing on the connection and the relationship between a mother and a child. For this assignment Stephanie wants us to photograph what ‘Mother and Child’ means to us and to our community or culture. However, this assignment also does not need to be literal. For instance, even though we as photographers do not have children yet, they consider themselves as mothers. For Stephanie Sinclair she considers herself as a mother to the children in her own photographs, whether they realize it or not. She is a mother to her friends and family when needed. Thematic words that come to mind for this Nat Geo assignment can also be nurture, compassion, protection and unconditional love. As Stephanie is saying it: ”– I chose Mother and Child as this month’s theme in large part because I’ve spent much of the last decade photographing young women and girls who were forced into marriage at very young ages and became mothers while still children themselves”, she says. The contributing photographer Kristian Bertel encountered a mother with a child in his participating photo. 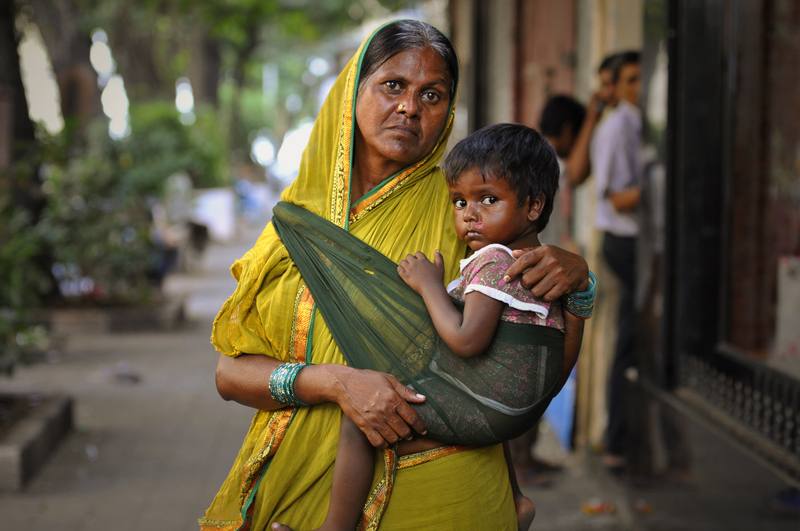 A mother is carrrying a child in her arms in the Colaba area of Mumbai, India. Beggars also rent babies from their mothers each day, to give their begging more credibility. The photograph is just one out of many photographs by the photographer taken in Maharashtra on his latest journey to the subcontinent of India. The scene of this mother holding a child in her arms left a big impression on the photographer. ”– If you look closer to the image you can see that the baby child has a wound in the face. A wound showing the hard life in the streets of India”, the photographer Kristian Bertel says.